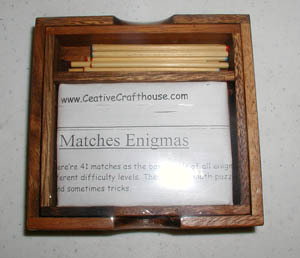 Matches Enigma combines a nice wood box and cover with 15 "matchsticks" and a booklet. The booklet contains 41 challenges that involve moving matchsticks from a starting position to a final pattern. These are classic puzzles that will provide hours of fun. Box measures about 4.5 x 4.5 x 1.25".